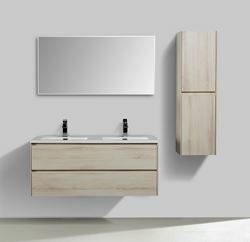 Milan Contemporary double bathroom cabinet 1200 mm L, rounded corners WHITE & BLACK ref KCM1200B Size: 1200 mm L x 480 mm D x 550 mm H Colour: WHITE sides with front in Rustic BLACK Optional Tall cabinet( wall), mixers and Mirrors. 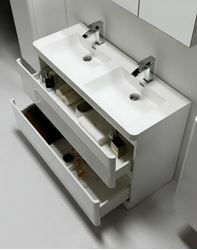 Notes.The price includes the basins, cabinet and overflow. 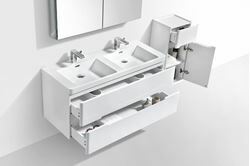 It excludes the basins waste, mixers, mirrors, side cabinets or tall cabinets. Please CHECK THE STOCK with us BEFORE placing any order. This model is also available in 600 mm L, 900 mm L and 1500 mm L in all above colours. Matching tall cabinets, compact side cabinets, mirrors and mirror cabinets are available.